Take Out is available from 11:30 am to close! You may also call 928.774.6100 to place an order over the phone. Scroll down for the Take Out/Delivery menu! From 4 pm to 9 pm we take the extra step of walking your food out to your car! Enter the alley from Leroux Street, between Route 66 and Aspen Ave. Pull into the designated parking space behind our building. Our take-out server will take your payment and bring your order out to your car. Hosting an event? Check out our Party Platters! Need help with your PostMates order? Use this PostMates page! Finally, Karma can be delivered! We’ve partnered with PostMates to manage your delivery. Simply use your PostMates account and have our Fresh. Beautiful. Delicious. food delivered anywhere in the greater Flagstaff area. Their app is available for Apple and Android. Scroll down for the menu! Diner’s Choice Award 2019 from Open Table. Enjoy our fresh, beautiful and delicious sushi and imaginative cocktails in our hip, casual downtown Flagstaff restaurant. Karma Sushi Bar Grill is consistently voted Flagstaff’s “Best Sushi, Japanese and Seafood” by readers of the Arizona Daily Sun. Non-sushi fans will find our menu includes burgers, fish & chips, teriyaki, fried rice and tasty ramen. Karma’s bar is stocked with your favorite spirits and staffed by our knowledgeable and inventive mixologists. We have happy hour early and late with great sushi and drink specials. Feeding a crowd? Order from our extensive takeout menu and check out our party platters! Whether you’re meeting friends after work or want to enjoy a special meal at home, Karma in Flagstaff is just right. 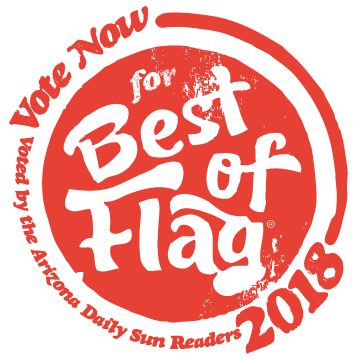 Voted Best Sushi in Flagstaff 9 Years in A Row!